I will mainly be at my artist alley table. I know I’m currently listed as A8 on the site but I swapped table with a friend of mine, just so there is no confusion. But its easy to find I’ll just be a couple tables down. 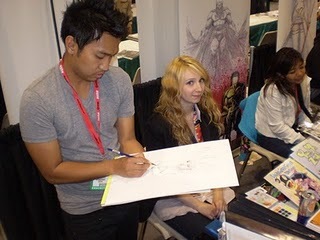 I will be doing autographs, commissions as well as free quick sketches, I take no list. First come first drawn. I’ll be signing at the DC booth throughout the weekend. I’ll be doing sketches at the booth for a donation to this great cause. Hope you guys swing by! Here’s a map of the convention floor. That’s about it. See you folks in NYC!